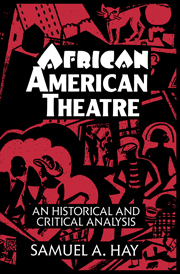 A landmark work in the study of Black theater and drama, African American Theatre offers the first comprehensive history of a major cultural phenomenon until now too often neglected. In this fast-paced investigation, Hay seeks out the origins of Black theater in social protest, as envisioned by W.E.B. Dubois, and as a formal branch of arts theater. Divided between these opposing forces--the activist and the artistic--Black theater, Hay argues, faced conflicts of identity whose traces still haunt the medium today. African American Theatre thus offers a means of locating Black theater in the larger context of American theater and in the continuum of African American history from the nineteenth century to the present--and in doing so offers a profile of dramatic expression shaped and scarred by the forces of repression, of self-affirmation, and of subversion. Sweeping in scope, original in approach and provocatively written, this important book mines the origins and influences directing Black theater, while charting a course for its future survival. Acknowledgments; Introduction; The black experience school of drama; The black arts school of drama; Theatre people: some splendid examples; The governance of theatre organisations; Development; Conclusion; Appendices.